Start every day fresh-faced with the Australian Bodycare Active Cleansing Brush and Skin Wash; a powerhouse skin-cleansing duo that effectively rids skin of makeup and daily grime to reveal a refreshed and luminous complexion. Combining a moisturising antiseptic body wash with a sonic-powered brush, the pair ensure skin is left smooth, soft and radiant. A water-resistant cleansing brush that utilises the power of sonic technology to deeply cleanse pores and aid exfoliation. Gently and effectively breaking up and dislodging dirt and impurities from pores using sonic vibrations, the cleansing brush decongests skin and enhances the efficacy of further skin treatments. Skin is left looking healthy, vibrant and refreshed. A gentle antiseptic hand and body wash for everyday use. Designed to protect from the spreading of bacteria to leave skin feeling fresh and hygienically clean. 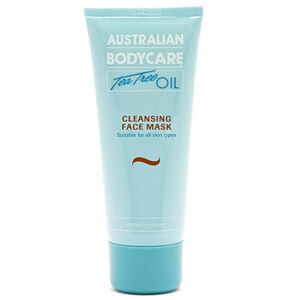 Its non-drying formula contains Tea Tree oil, known for its anti-bacterial properties to provide deeply penetrating treatment for minor skin troubles. The lightweight liquid provides nourishing ingredients which work to revive dry skin and retain the skin's natural moisture levels. The handy pump action bottle allows easy application and the wash absorbs quickly into skin. Squeeze a pea-sized amount of Skin Wash into the palm of your hand and apply evenly to skin. Wet the bristles of the Active Cleansing Brush and gently massage into skin to remove makeup, dirt and impurities. Skin Wash: Aqua, Sodium Laureth Sulfate, Coco-Betaine, Melaleuca alternifolia leaf oil, Sodium Chloride, Phenoxyethanol, Citric Acid, Methylparaben, Ethylparaben, Propylparaben, CI 75811.